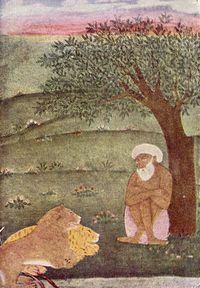 Dervish or darwish (from Persian: درویش‎, Darvīsh) in Islam can refer broadly to members of a Sufi fraternity (tariqah), or more narrowly to a religious mendicant, who chose or accepted material poverty. The latter usage is found particularly in Persian and Turkish, corresponding to the Arabic term faqir. Their focus is on the universal values of love and service, deserting the illusions of ego to reach God. In most Sufi orders, a dervish is known to practice dhikr through physical exertions or religious practices to attain the ecstatic trance to reach God. Their most common practice is Sama, which is associated with the 13th-century mystic Rumi. In folklore, dervishes are often credited with the ability to perform miracles and described with supernatural powers. A Pakistani Dervish at Tulamba (May 2008). The Persian word darvīsh (درویش) is of ancient origin and descends from a Proto-Iranian word that appears in Avestan as drigu-, "needy, mendicant", via Middle Persian driyosh. Dervishes try to approach God rather by virtues and individual experience, than by religious scholarship. Many dervishes are mendicant ascetics who have taken a vow of poverty, unlike mullahs. The main reason they beg is to learn humility, but dervishes are prohibited to beg for their own good. They have to give the collected money to other poor people. Others work in common professions; Egyptian Qadiriyya – known in Turkey as Kadiri – are fishermen, for example. The whirling dance or Sufi whirling that is proverbially associated with dervishes is best known in the West by the practices (performances) of the Mevlevi order in Turkey, and is part of a formal ceremony known as the Sama. It is, however, also practiced by other orders. The Sama is only one of the many Sufi ceremonies performed to try to reach religious ecstasy (majdhb, fana). The name Mevlevi comes from the Persian poet Rumi, who was a dervish himself. This practice, though not intended as entertainment, has become a tourist attraction in Turkey. There are various orders of dervishes, almost all of which trace their origins from various Muslim saints and teachers, especially Imam Ali. Various orders and suborders have appeared and disappeared over the centuries. Dervishes spread into North Africa, the Horn of Africa, Turkey, the Balkans, the Caucasus, Iran, Pakistan, India, Afghanistan, and Tajikistan. 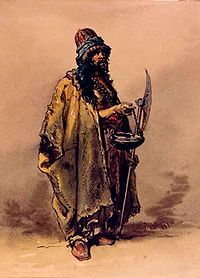 Other dervish groups include the Bektashis, who are connected to the janissaries, and the Senussi, who are rather orthodox in their beliefs. Other fraternities and subgroups chant verses of the Qur'an, play drums or whirl in groups, all according to their specific traditions. They practice meditation, as is the case with most of the Sufi orders in South Asia, many of whom owe allegiance to, or were influenced by, the Chishti order. Each fraternity uses its own garb and methods of acceptance and initiation, some of which may be rather severe. The Dervish movement was an early 20th-century Somali Sunni Islamic state that was established by Mohammed Abdullah Hassan, a religious leader who gathered Somali soldiers from across the Horn of Africa and united them into a loyal army known as the Dervishes. This Dervish army enabled Hassan to carve out a powerful state through conquest of lands claimed by the Somali Sultans, the Ethiopians and the European powers. The Dervish movement acquired renown in the Islamic and Western worlds due to its resistance against Britain and Italy. The Dervish movement successfully repulsed British-led Somali and Ethiopian forces four times and forced them to retreat to the coastal region. The polity also maintained relations with other authorities, receiving support from the Ottoman and German empires. The Turks also named Hassan Emir of the Somali nation, and the Germans promised to officially recognize any territories the Dervishes were to acquire. The Dervish movement was finally defeated by the British in 1920. Various western historical writers have sometimes used the term dervish rather loosely, linking it to, among other things, the Mahdist uprising in Sudan and other rebellions against colonial powers. In such cases, the term "dervishes" may have been used as a generic (and often pejorative) term for the opposing Islamic entity and all members of its military, political and religious institutions, including persons who would not be considered "dervishes" in the strict sense. For example, a contemporary British drawing of the fighting in Sudan was entitled "The defeat of the dervishes at Toski" (see History of Sudan (1884–1898)#British response). A Qajar-era Persian dervish, seen here from an 1873 depiction of Tehran's Grand Bazaar. Kashkul, or Beggar’s Bowl, with Portrait of Dervishes and a Mounted Falconer, A.H. 1280. Brooklyn Museum. Wikisource has the text of the 1905 New International Encyclopedia article Dervish. ^ "Dervish - Definition and More from the FreeMerriam - Webster Dictionary". M-w.com. Retrieved 2012-02-19. ^ Dervish, Encyclopaedia Britannica, Dervish, Arabic darwīsh, any member of a Ṣūfī (Muslim mystic) fraternity, or tariqa. ^ The Masnavi: Book One, translated by Jawid Mojaddedi, Oxford World's Classics Series, Oxford University Press, 2004. ISBN 978-0-19-955231-3, p63. ^ Koentges, Chris. "13 Things The Whirling Dervishes Can Teach You About Spinning Until You're Dizzy Enough To Puke". The Very Ethnic Project.